Complete IS-3000 staging kit for 2.2" diameter airframes. 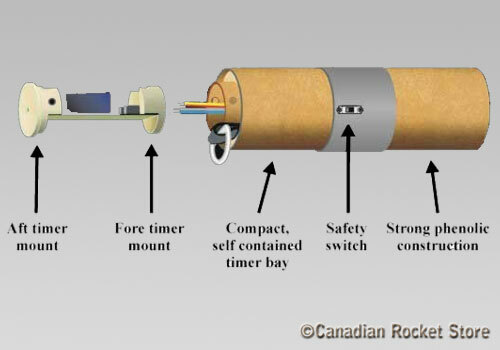 Interstage Couplers are used to house staging timers and to connect the upper and lower stages together. The Interstage 3000, the latest version from PML, is used in our two-stage rocket kits, but is now available for scratchbuilders designing their own staged rockets. Using an IS3000 system from PML is a quick, simple solution to an often-difficult design problem. To use an IS-3000 system, the booster needs 3" clear space (regardless of diameter) at the top, just like a regular rocket would for a payload coupler or nosecone shoulder. The sustainer (upper stage) also requires 3 1/4" clear space at the bottom. Click here for IS-3000 design requirements. * The Is-3000 module is designed for AccuFire or Transsolve ST-2b timer, it can be modified however to accommodate other timers. Build supplies and timer are not included.